Thanks to At the Library for suggesting today’s fan-tastic jewelry. Her favorite shows are Mad Men, X-Files, and Family Ties. Am I the only person who hasn’t watched Mad Men? The Sesame Street spoof, sure, but never the show. First up: MAD MEN this is a theme that deserves an entire blog unto itself. The 60’s style vintage jewelry is across the board stunning. I started down the rabbit hole, and lusted after every piece I came across. 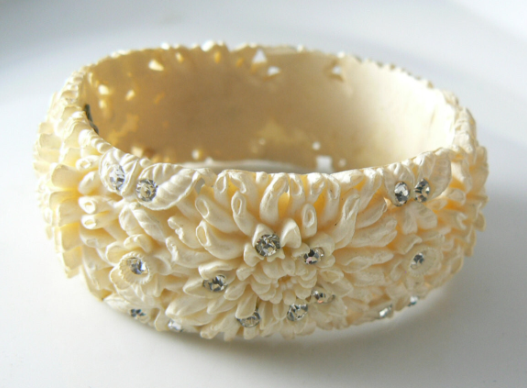 To narrow down I searched out Bakelite bangles and discovered this darling on line site Vintage Lane Jewelry. They ship internationally from Anaheim, though (disclaimer) I’ve never shopped their site. *sigh* Seriously? Be still my heart. They seem pretty reasonably priced, too. 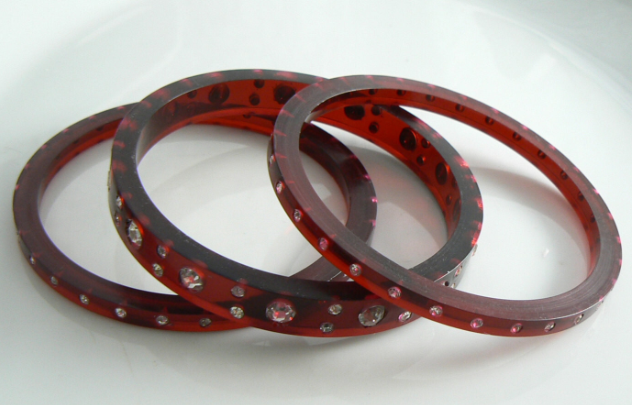 $28.50 for the cream bangle, $54 for the carved roses, and $105 for the Cherry colored trio. That last one is what I covet, though unfortunately sold out. 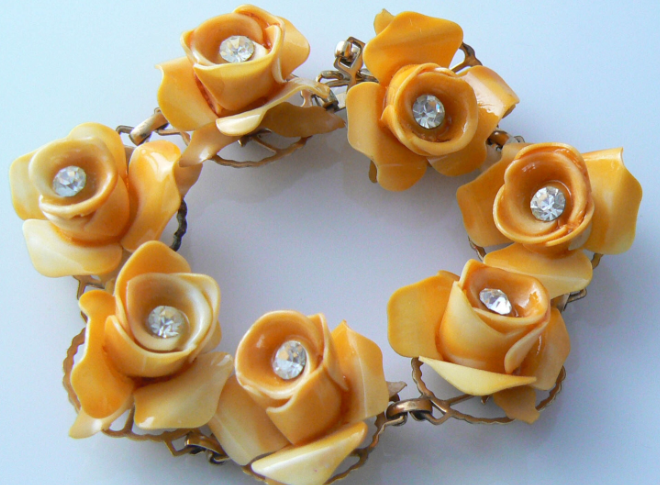 Bummer, why tease me, Vintage Lane Jewelry? Mama wants to shop! Stay tuned for X-files and Family Ties. I think I have my work cut out for me, but do share your favorite shows and I’ll give them the Very Bangled treatment next. I love the Mad Men-esque jewelry you found, especially the last two. I started watching Mad Men while it was partway through season 1, no idea what to expect but it’s phenomenal and it’s worth watching for the fashion evolution alone. Thanks for posting these! Thanks! This is a really fun project so thank you for the suggestions.